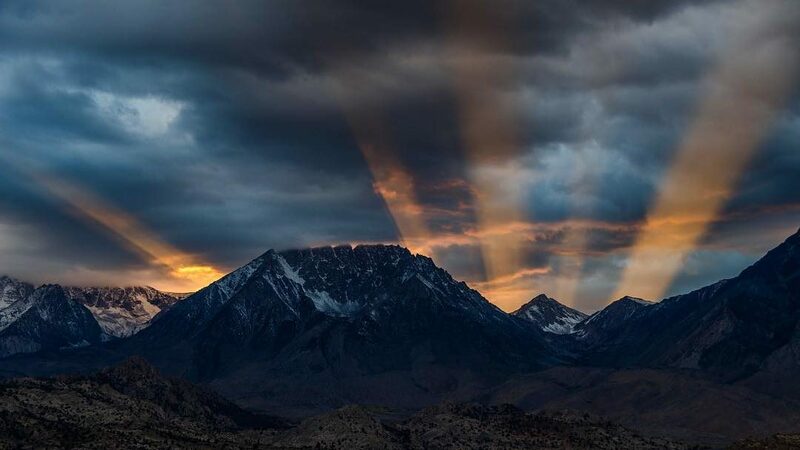 Winter in the Eastern Sierra is wild and wonderful and always unpredictable. The region is well-known worldwide, as a premier hiking destination. The Pacific Crest Trail, the John Muir Trail and the hike up to the highest point on the continental US; Mt. Whitney, are major draws for hikers from around the world. Except for the most adventurous among us these trails are not well suited to winter hiking. But did you know, that whether the mountains and foothills are covered in feet of snow, or just getting a dusting, there are many wonderful hiking trails at the lower elevations to satisfy even the most intrepid hiker? There are easy, moderate and strenuous hikes that can be easily accessed for a mellow stroll or hours of energetic hiking. These trails and hiking areas can be enjoyed by the whole family, including the furry members, or for those in search of serene beauty and solitude. Since our ‘lower elevations’ are situated between 4,500 and 7,000 feet above sea level, this also presents a perfect opportunity for high Sierra hikers to prepare for multi-day hikes and begin their acclimatization for the higher elevations of the Sierra Nevada. The lower Owens River twists and turns for 40 miles between Pleasant Valley reservoir – 10 miles north of Bishop, and Tinemaha reservoir – 24 miles south of Bishop. Along the floor of the Owens Valley this river’s vast flood plain has an extensive network of tracks and trails that meander alongside the river, and its adjacent canals. These paths weave and undulate over grassy banks, between tall reeds, and over sand dunes and offer the opportunity for a short stroll or a long interesting hike. Hiking alongside the waterways of the valley floor provides little elevation change, but it has an almost limitless number of miles of diverse and open terrain. The recently restored Buckley ponds have access for the physically disabled to be at the water’s edge to fish or just enjoy the view. The canals around the outskirts of town are a great place to let kids and dogs romp in safety. A walk along the shores of Pleasant Valley reservoir is easy and quiet. The road alongside the east shore of the reservoir is closed to vehicle traffic and it’s a great place for a midday winter walk. The canyon walls rise several hundred feet above the canyon floor and on calm days the water is mirror-like. The dam that created this reservoir was built in the 1950s by the Los Angeles Department of Water & Power (LADWP) for water storage and the lake is a very popular angling area. Birdlife in the canyon is abundant and the reservoir is a prime fishing destination. Two intriguing canyons are located in the tablelands north of Bishop and just east of Pleasant Valley Gorge along Chalk Bluff road. The Happy and Sad boulders are frequented by rock climbers for big boulders and low canyon walls that present challenging “problems” for both beginner and advanced climbers. These canyons also present great opportunities for short, interesting hikes within the canyon walls. Each canyon is about a mile long and trails curve in and around the rock formations that are sculpted in the soft rock that makes up entire plateau. About 760,000 years ago a massive volcanic eruption emptied the magma chamber below the area that is now the Long Valley Caldera, about 22 miles northwest as the crow flies. It released very hot ash that subsequently cooled and hardened. These canyons and the well-known Owens River Gorge were then formed when water cut through the soft rock we now call Bishop Tuff that makes up this escarpment. This is an easy, but longish, hike along a dual-track dirt road just south of Big Pine, 18 miles south of Bishop. It loops around McMurry Meadows providing an excellent view of the dramatic Crater Mountain and lovely Owens Valley. The loop follows McMurry Meadows Rd and Little Pine Creek for a 10-mile round trip with about 1,500 feet of elevation gain/loss. For a shorter trip follow McMurry Meadows Rd along the base of Crater Mountain for an out and back as energy and time permits. Crater Mountain is a fascinating geological feature that has been designated as a BLM (Bureau of Land Management) Wilderness Study Area. It forms part of the larger Big Pine volcanic field that includes Red Mountain, Fish Springs Cinder Cone, and Perlite Dome among many others. Situated just west of Lone Pine in the Alabama Hills, 60 miles south of Bishop, the Mobius Arch trail has a unique feature that sets it apart from any other in the region. The Mobius Arch is the largest and most picturesquely situated of the many natural arches located in the Alabama Hills. It almost perfectly frames Mt. Whitney, the highest peak in the contiguous USA. The arch is named for a mathematical phenomenon known as the Mobius strip which it resembles. This beautiful, one-mile loop trail is a combination of easy to moderate hiking with some steep sections and a couple of large stone steps. On warmer winter days the late afternoon is particularly lovely as the sun sets behind the crest and, if high cloud is present, creates a spectacularly colorful display. The entire Alabama Hills area is a magnificent hiking area with numerous roads and trails winding through the stunning rock formations. On the Sherwin Plateau between the settlements of Swall Meadows and Paradise, about 18 miles north of Bishop, is another unique feature of the area. This one, however, was manmade, a little more 100 years ago. Etched into the Bishop Tuff are deep ruts made by miners’ wagons that were drawn by teams of 20 mules. This old ‘road’ is now just a distant memory of when mining in California was in its heyday, but there are a number of still clearly discernible wagon tracks carved into the rock. The hike can be done the relatively easy way, downhill for just 2.5 miles and 1,000 feet of descent, which includes some rocky steps and minor obstacles. For a more strenuous hike, and no need for a shuttle ride, hike it up and down for a 5-mile round trip. A hike into the magnificent Owens River Gorge in winter offers warmth, protection and a very different view of the Eastern Sierra. The river runs clear and deep and the gorge is a magnificent riparian habitat with an increasing biodiversity following rewatering and ongoing restoration by the Los Angeles Department of Water & Power (LADWP). Bird species are flourishing and a native fish, the Owens Tui Chub, once threatened and endangered, is now protected in this predator-free habitat. It’s an out and back (or down and up) for as far as you wish to hike. The first 1.25 miles is paved to the LADWP power plant and just beyond that the track becomes dirt. Further upstream you’ll come across the skeletal ruins of a now derelict power plant and on either side of the river you’re likely to see climbers testing their skills on these vertical walls. Continue further and the track becomes a trail and scrambling and clambering become the order of the day. Take a picnic and find a sunny, warm spot to sit quietly and listen to the tumbling call of the canyon wren. The air is brisk, but the sunshine is bright and warm and hiking out across the sagebrush and up onto the rocky outcrops of the Tungsten Hills is especially lovely during winter. With easy access from the Horton Creek campground (closed for camping during winter) you can park your car here and take a short walk or long hike up and around this fascinating geological feature. The hills are named for the tungsten that was mined here until the late 1940s and are composed primarily of granite and quartz diorite. It’s a favorite place for rock hounding and crystals of red garnet can still be found here. Whether you have an hour or a whole day to explore this region it’s well worth the time. The views are breathtaking with vistas in every direction from the numerous peaks. Survey markers can be found on many of the peaks and only two, the Tungsten Point and the unnamed Tungsten Hills highpoint, have summit registers. If you’re a peak bagger, you should definitely add these to your list. This beautiful trail weaves among tall Jeffrey pines and thick groves of aspen trees as it follows Rock Creek from the top of the Sherwin Plateau down the narrow canyon for about 8 miles one-way. It is regarded as one of the best mountain bike trails in the region, but it also gives hikers the chance to experience the remoteness of a narrow mountain trail without having to hike into the high country. The trail is divided into three sections and it can be hiked up or downhill from any of the four access points. A short, but moderately steep hike enters the mouth of a high walled slot canyon cut into the side of the larger Pine Creek canyon. As with so many areas around Bishop these walls are popular with climbers, particularly those who aspire to bigger wall and multi-pitch climbing. The view from the mouth of the gully looks out across the Owens Valley to White Mountain Peak, some 30 miles away. This is a great hike to get a quick burst of exercise and experience terrain that is rough and rocky. A leisurely stroll along well-worn climbers’ trails in and around the gargantuan boulders of Buttermilk Hill is definitely an easy morning or afternoon hike. But a more adventurous hike of more strenuous proportions can be done around and up to the top of Buttermilk Hill. It is deceivingly large and there are numerous dual-tracks and single-track trails that circumnavigate this rocky hill. Surmounting the peak will require some cross-country scrambling and it has a magnificent 360-deg view that is absolutely breathtaking. Getting to the Druid Stones is definitely an uplifting experience. The hike climbs about 2,000 feet in a little under 3 miles and delivers a bird’s eye view of Bishop and the Owens Valley below. 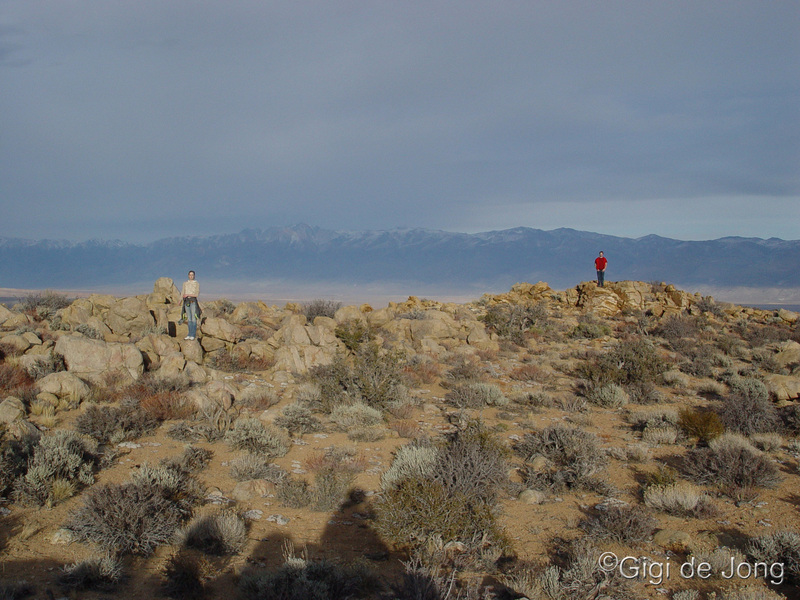 The hike follows a very obvious trail from the base of the Coyote Ridge just off Bir Road, about 5 miles from the center of Bishop. The Druid Stones area is another well-liked spot for rock climbing, but not as often frequented by climbers because of the relatively long and steep ascent. A winter hike here will often provide good exercise in peaceful solitude. A 2 hour drive of about 65 miles from Bishop along a winding mountain pass and through some of the most remote and rugged terrain in the west is reason enough to take this trip. The last 10 miles of the drive is on graded dirt, but it can be a little rough due to washer-boarding. This adventure is definitely an all-day affair and it’s best that you make sure you have enough fuel, food, water and warm clothing for everyone along. Snowfall may close the pass sometimes in winter so make sure to get the latest information on road and weather conditions. Daytime temperatures can be warm with nighttime temps falling well below freezing. 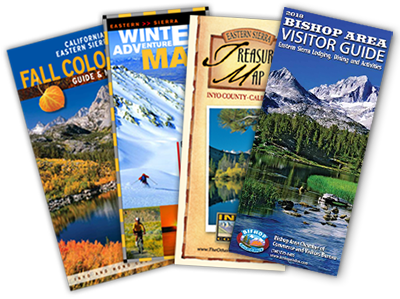 Come in or call the Bishop Visitor Center at 690 N. Main Street, (760) 873-8405, to get more details, directions, maps and brochures about these hikes and many others in the area. Let the friendly, knowledgeable staff help you plan your visit to get the best experience and the most from your time. As always – it is important to remember that winter in the Eastern Sierra is unpredictable and often chilly. Days can be warm and nights cold. Bring clothing to dress in layers. Bring the kids, the dogs, family and friends, binoculars and a camera, and definitely bring your hiking shoes.